"Denying us an education, denies progress in our communities and in our nation,” said a DACA college student in Arizona. Kevin Alvarez and Omar Gomez are two of the more than 2,000 DACA students in Arizona public colleges who are reeling from the news that state colleges will no longer grant them in-state tuition. 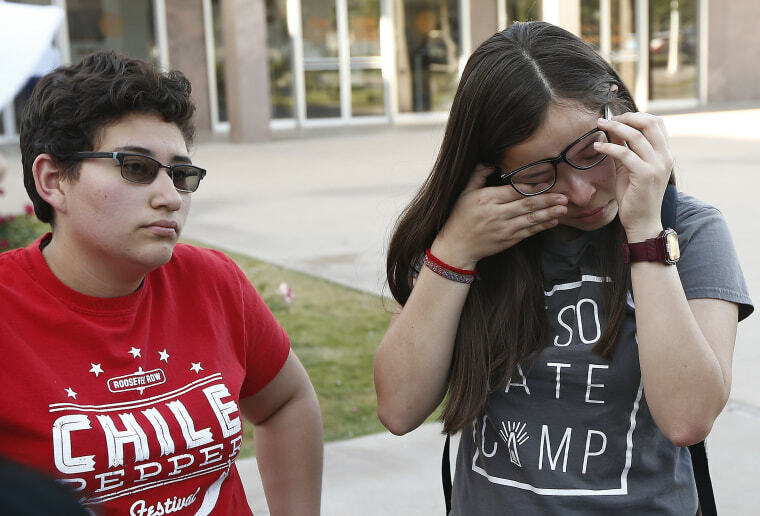 “This decision puts uncertainty in my life,” said Alvarez, a 21-year-old junior at Northern Arizona University studying elementary and special education. The news came Monday when the Arizona Supreme Court upheld a lower court decision stating that state laws don't allow colleges and universities to grant in-state tuition to students without permanent legal status. “I mean 70 years ago, segregation was allowed and officials were following the law, but that doesn’t mean they were in the right side of history,” said Alvarez, who was brought to the U.S. from Mexico when he was 3 years old and is currently protected under DACA. Under the Deferred Action for Childhood Arrivals program, known as DACA, young immigrants like Alvarez and Gomez who were brought to the state as children have been able to work and study in the U.S. without fear of deportation. “I grew up here. I go to college with all my friends from public school. We face the same economic hardships, and the decision was almost this message of ‘No, you don’t deserve it. You are not worth it,’“ said Gomez, who was born near the Oaxaca Valley in Mexico and has lived in Arizona for over 18 years. Although students like Gomez and Alvarez are able to enroll in college with their DACA status, they’re not eligible to apply for financial aid or most scholarships. They have limited access to loans, making it increasingly difficult to afford college. Both students have on-campus jobs that help them pay tuition and expenses, but they admit that’s not always enough, and it's going to be harder now. “We don’t get that much help already. That’s why I’ve been working all my life,” said Gomez. As of Tuesday afternoon, the students had received a message of support from the office of multicultural services, according to Gomez. They were waiting for concrete details from the university as to what’s next in terms of tuition costs and payments. Immigrant rights organizations like Promise Arizona are using the decision to fuel their political mobilization ahead of the upcoming midterm elections. “All good people need to vote to change this horrid situation in November before the just and compassionate America we aspire to be is lost forever," said executive director Petra Falcon in a statement following Monday's news. Until Monday's Supreme Court ruling, DACA recipients had been able to pay in-state tuition rates at Arizona State University, University of Arizona and Northern Arizona University since 2015. The rates were substantially less than what non-resident students pay. According to a local paper, the in-state rate for undergraduate students at Arizona State University is $10,640 — compared to $26,470 for non-resident students. At Maricopa Community Colleges, the in-state rate is $86 per credit hour versus. $241 for non-residents. Following Monday's decision, Arizona State University said in a statement that DACA students may be eligible for more affordable tuition costs if they graduated from an Arizona high school and are “lawfully present” in the state. DACA students hope measures like this help prevent their tuition from doubling or even tripling. “People need to understand that denying us an education, denies progress in our communities and in our nation,” said Gomez. Additional reporting from NBC Latino contributor Stephen A. Nuño.